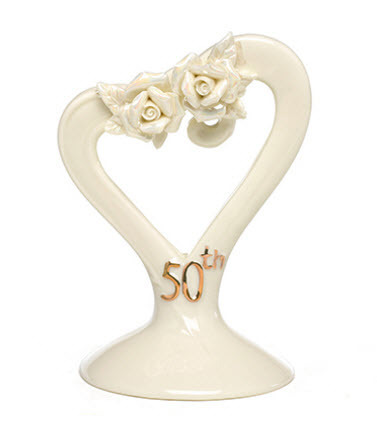 The wedding anniversary cake topper is what makes your anniversary cake special to you, you can get some great cake toppers now from traditional to funny. A sweet traditional idea is to have a replica wedding cake made, you will need to find the wedding photos, take a copy and visit a couple of bakers to get an idea of price and also whether they can do it! You may find that the original cake topper was kept otherwise it may be a visit to ebay for a vintage cake topper. To complete the look have a framed photograph of the anniversary couple cutting the original wedding cake! 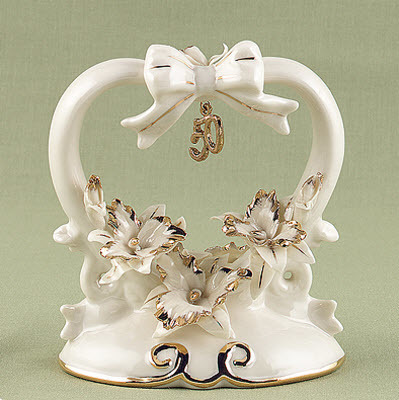 Another traditional cake topper idea is to have the number of the wedding anniversary ie 50 and then decorate the cake either with flowers or bells. 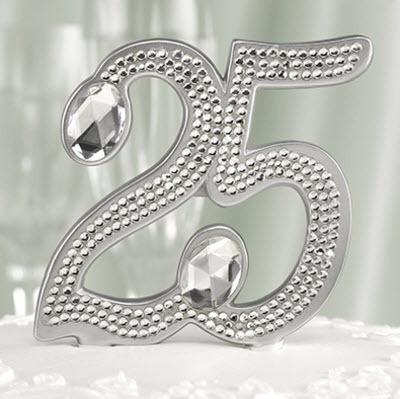 You can buy numbered cake toppers and quite often they are in the colors of the anniversary. If you can't find the right number then have a look at birthday cake toppers or make your own. 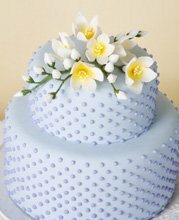 You can make your own numbered cake topper using the foam or card numbers that you can find at craft stores. Start by taping skewers to the base of the numbers so that you can stick them in the cake. (technical term - stick them in the cake!) Then you are happy they will stay put you can decorate them. You could cover them with papiermache, or just paint them the colors for the anniversary. 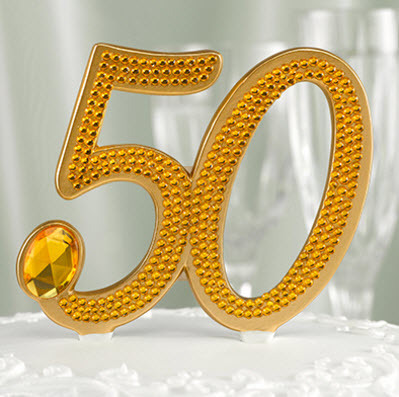 Your 30th anniversary would be pearl, 35th anniversary - jade or coral, 40th anniversary would be ruby, 45th anniversary sapphire, 50th anniversary gold, 60th and above would be diamonds! 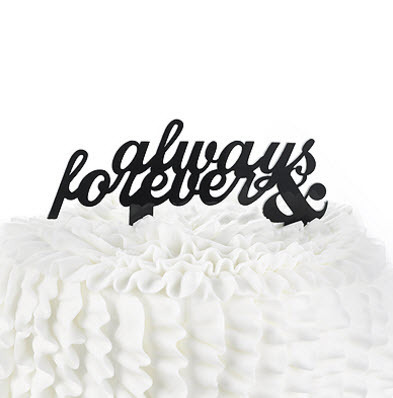 Of course you can also buy your numbered cake topper! 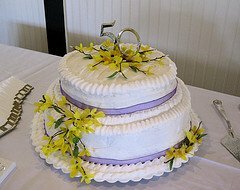 You could also use the color of your wedding anniversary for the anniversary cake and have the cake topped with sugar paste flowers or the real thing! The flowers could be the same as your wedding or they could be the anniversary flower for that year, or your favorites! Rather than a bride and groom on the top of the cake you could have a couple enjoying their favorite hobby; golf, sailing, walking. You could have a modern cake almost like today's wedding cakes with cake tiers, you could have this decorated with flowers - real or sugar paste. 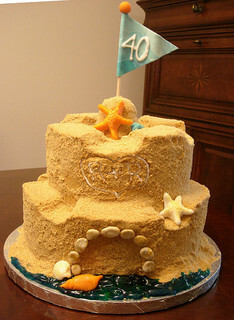 Fun novelty cakes are great - a suitcase ready for their anniversary trip of a lifetime, a big present, a cruise ship, a set of golf clubs, dancing shoes - think about your anniversary couple - what would they think is fun. At my in-laws silver anniversary party the grandchildren insisted the cake had 25 candles and that we sang "Happy Anniversary to you" to the tune of Happy Birthday! 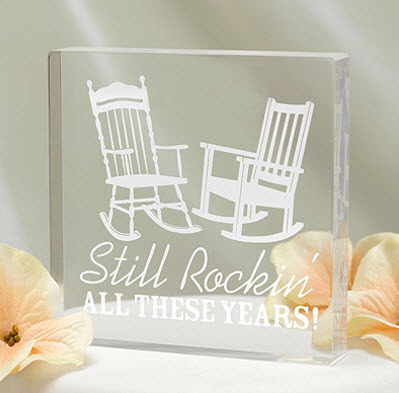 Here are some lovely anniversary cake toppers available at the moment.